This really isn't a new tip, but as someone just asked on Twitter for a quick explanation, I thought I'd write it up. If you want to sync Brackets extensions across multiple machines, the easiest way to do it is with Dropbox, or a Dropbox-like service. As long as it creates a physical folder on your machine, you can simply store your extensions there (for me it is /Users/ray/Dropbox/BracketsExtensions) and then create a symlink between that folder and the folder Brackets uses for extensions. What folder is that? 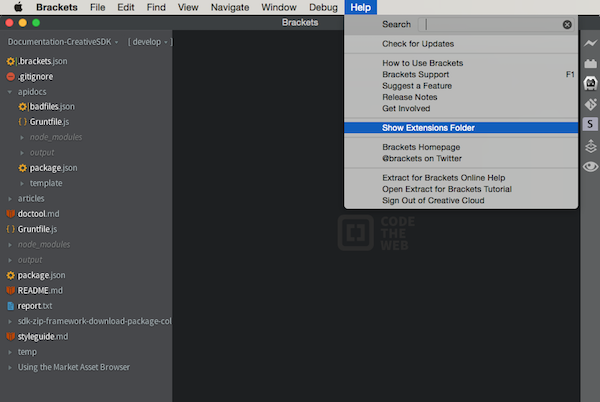 In the Bracket's Help menu, simply click "Show Extensions Folder."